PROFESSIONALS CONFERENCE KIDS WILL BE KIDS, WON’T THEY…? This year Cinekid is celebrating its 30th edition - an excellent moment to take a look at how storytelling has evolved, but also to assess how the audience has changed. The media industry is continually changing. On the one hand kids will always have the same wants and needs no matter how much the world around them is transforming. On the other hand, the changing communications landscape means that today children have different relationships with media. As professionals in the kids media industry our goal is to create enticing and innovative ways to engage our audience via new content and products that push the limits of technology - at the same time not forgetting to take children seriously. Let’s ask ourselves the question: in the everchanging media landscape, kids will be kids. Won’t they…? Children’s media professionals are always seeking new ways to reach their audience and for ways to innovate: new stories, new technologies, new ideas. In order to achieve this, it is sometimes necessary to step away from the well-worn path. That’s why this year’s theme will be about breaking boundaries and rediscovering media while redefining the industry’s responsibilities. Think of a young child growing up with an open mind: a clean slate with endless possibilities, free of all preconceptions. Boundaries, preconceptions and limitations are inevitably picked up along the way. These can be important to structure and understand the world around us, but they also constrain our imagination and creativity. In order to stay connected with young audiences, let’s try to take a look through their eyes. We might find a fresh perspective on today’s reality and future possibilities. Moreover, we need to take children seriously as makers themselves. Kids today are consuming, creating and dealing with media in different ways. What can industry professionals learn from them? As the lines between traditional and new media, and between physical and virtual/digital reality, are fading, the content that children are consuming and creating no longer fits into the originally defined categories of film, television and new/digital media. What possibilities open up when we choose to ignore these boundaries? The morning programme includes Lego’s Creative Manager of Digital Games Jais Christensen and David Kleeman of Dubit, who will be breaking boundaries by addressing play design through a child’s eyes. 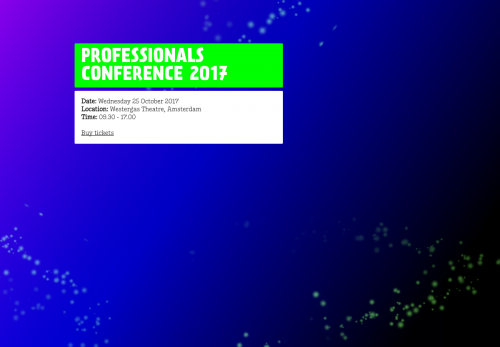 Also joining the programme are Sarah Cox, Creative Director at Aardman and Rémi Chayé who will tackle choices in animation. Cathrine Simonsen from NRK joins the conference discussing the NABC method in developing the immensely popular series SKAM. In the afternoon the wonderful Monika Bielskyte, founder of ALLFUTUREVERYTHING, joins the line-up to address alternative ways to envision the future of immersive technologies. In addition, Claire Cook from Nexus Studios dives into narratives and storytelling within interactive productions. And that’s not all! Other speakers include Luna Maurer, founder of Amsterdam-based interactive design studio Studio Moniker, Geoffrey and Anita Fontaine from W+K Amsterdam, and Regine Debatty, founder of the award-winning blog We Make Money Not Art.